At 5:30 a.m. Tuesday, the line of waiting customers stretched down the side of the building on Main Street in Saco. SACO — Sonia and Moe Damon of Saco rolled out of bed long before dawn Tuesday, wrapped themselves in jackets and blankets and headed outside to wait for the doughnuts. 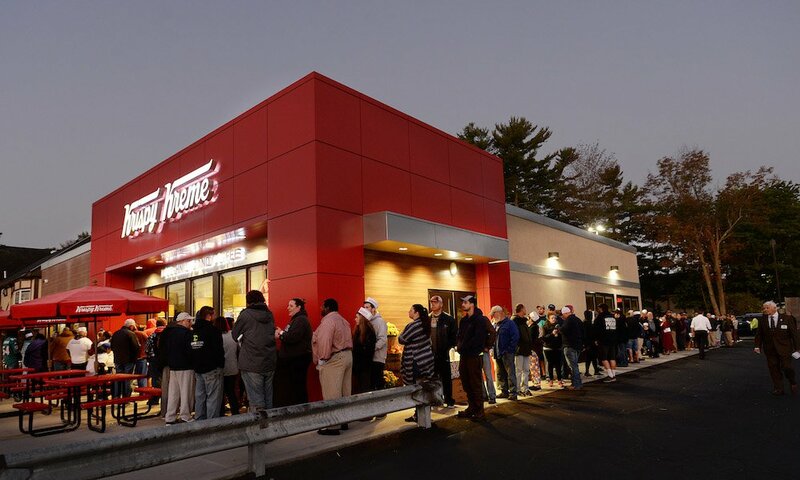 The mother and son joined dozens of other fans of Krispy Kreme Doughnuts for the opening of the first location in Maine. The arrival of the iconic doughnut shop in Maine was welcome news to the Damons, who eagerly watched the construction of the store and planned to be there when the “hot light” sign was lit for the first time. The family first discovered the doughnuts during a vacation in Erie, Pennsylvania. The store officially opened at 6 a.m. as the first doughnuts of the day moved out of the fryer to be coated with warm glaze. 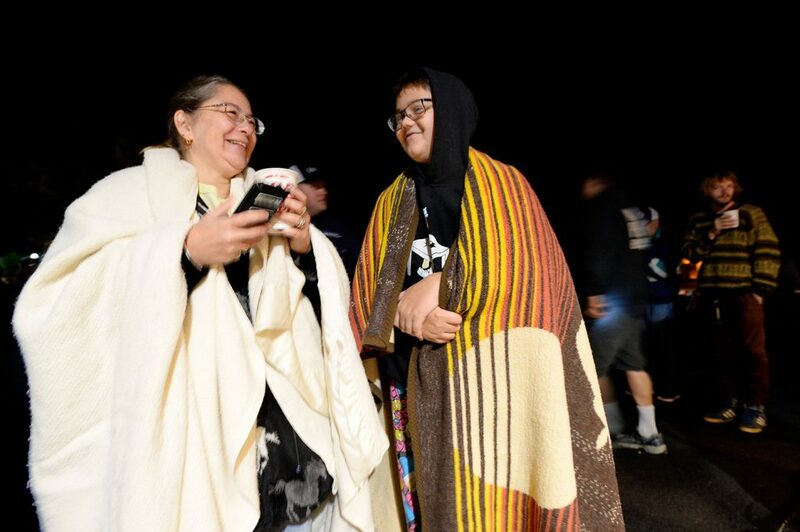 Festivities began Monday, with the first fans showing up to stake out their spot in line at 3 a.m. – more than 24 hours before the first doughnuts were sold. 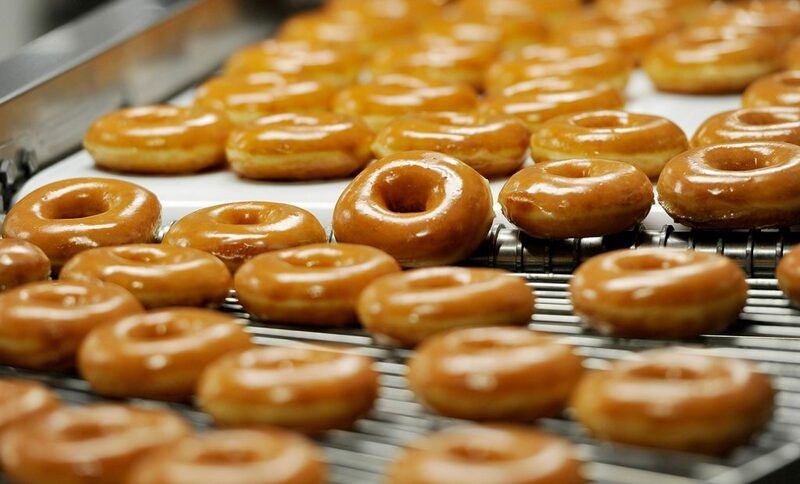 The first person in line got a dozen doughnuts a week for a year, while the next 99 get a free dozen each month. The free doughnuts were an exciting prospect for Erin Lally and her boyfriend, Brendan Farrell. The Biddeford couple and their 4-month-old son, Waylon, arrived at 1:30 a.m. and were numbers 50 and 51 in line. Farrell and Lally became fond of Krispy Kreme doughnuts when there was a location in Medford, Massachusetts, and missed them when it closed. “We haven’t had Krispy Kreme in a long time,” Lally said. Cort Mendez, president and CEO of NH Glazed, said the Saco store is one of about a half-dozen in the country with Krispy Kreme’s new design, which looks more like a cafe then the traditional doughnut shop. But like all Krispy Kreme locations, a viewing window allows guests to watch the doughnuts being made. Mendez will have another location in Auburn that is expected to open in November, and is considering opening more Krispy Kreme shops in Windham, Bangor and in two New Hampshire towns. A former Five Guys franchisee, Mendez said he was drawn to Krispy Kreme in part because of the smiles the doughnuts bring to people’s faces and his own memories of eating at Krispy Kreme while growing up in Baltimore. City officials welcomed the new store, not just because it adds to the city’s diverse food offerings, but because of the jobs and investment in the community that came with it, said William Mann, Saco’s economic development director. The store has 35 full-time employees, 35 part-time employees and offers medical and dental insurance and tuition reimbursement, he said. At 5:30 a.m., the line of waiting customers stretched along the side of the building. 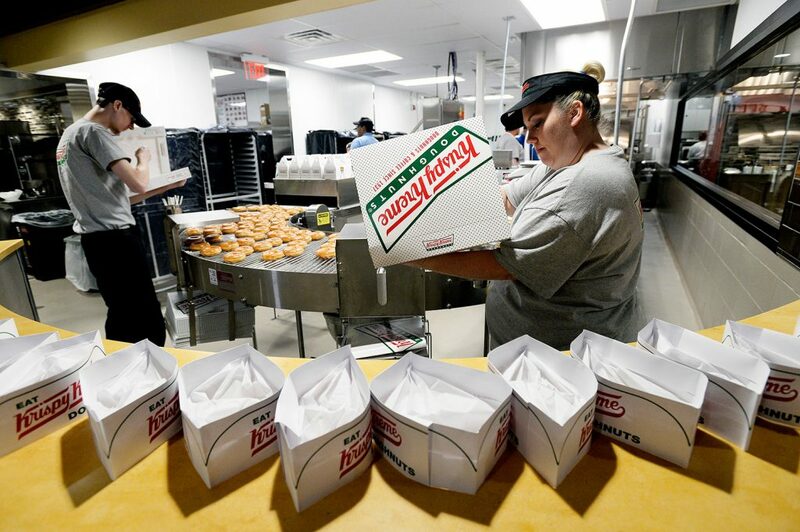 Inside, the first glazed doughnuts of the day came off the line and were boxed by some of the employees. The machine produces 270 dozen doughnuts an hour. 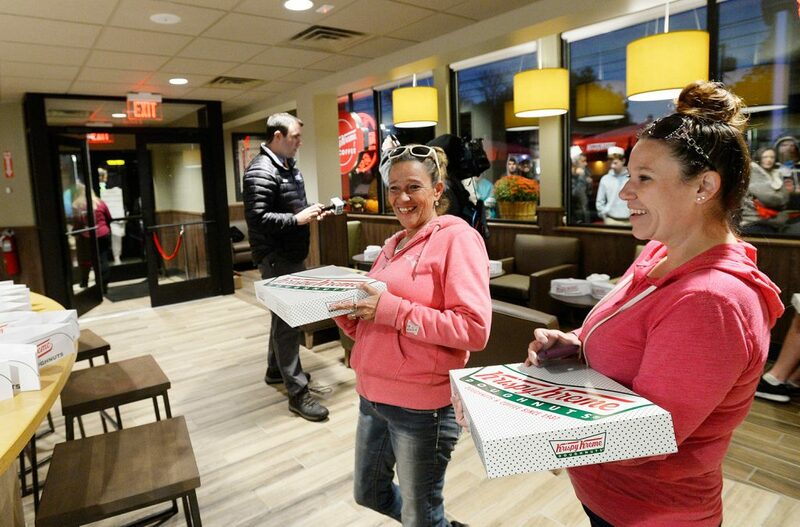 The “hot light,” which indicates fresh doughnuts are ready, lit up minutes before the doors opened at 6 a.m.
Alice Gagne and her daughter Amanda Culbertson, both of Saco, were the first in line and each snagged a dozen glazed doughnuts. “We just wanted to be part of the experience,” said Gagne, who plans to share her dozen free doughnuts each week with friends and co-workers. Near the back of the line, 2-year-old Giovanni Palmariello waited with his mom, Kassie, of Kennebunkport. Giovanni wore a costume that looked like a dozen doughnuts, while his mom sported a doughnut headband. Giovanni said he was excited to get a chocolate doughnut. “This is the best thing to hit Maine since lobster rolls,” Kassie Palmariello said.